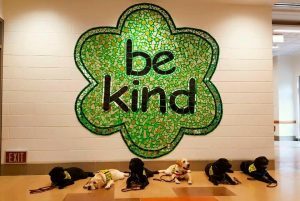 A Psychiatric Service Dog is a specific type of Service Dog trained to assist their handler with a psychiatric disability, such as post-traumatic stress disorder, schizophrenia, depression, anxiety, ​or​ bipolar disorder. A Psychiatric Service Dog is individually trained to do work or perform tasks that mitigate their handler’s disability. Training to mitigate a psychiatric disability may include providing environmental assessment (in such cases as paranoia or hallucinations), signaling behaviors (such as interrupting repetitive or injurious behaviors), reminding the handler to take medication, retrieving objects, guiding the handler from stressful situations, or acting as a brace if the handler becomes dizzy. If you have a psychiatric disability, have been in therapy for a minimum of one year, live within 30 miles of Newtown, CT, and believe that a Service Dog could drastically improve your life then you may apply. Please note that we are a small organization with very limited resources and many applications. It may not be possible to reply to every inquiry. You will be notified if a dog becomes available and according to your application could be a good fit. This could be within a year or we may never have a dog that fits your needs. Our do gs are placed with the people that we believe will be the most successful with the dog that is given to them. The Exceptional Sidekick does not train balance dogs, seizure alert dogs, or guide dogs for the blind. We are only accepting applications for Psychiatric Service Dogs at this time. Once those needs are met we will accept applications for other disabilities. We have the right to deny Service Dogs for any reason. If your application does not appear to be a good fit for a Service Dog we will let you know as soon as possible. If you are in desperate need for a service animal then we encourage you to reach out to as many organizations accredited by Assistance Dogs International as possible. Our wait list can be well over 2 years long. 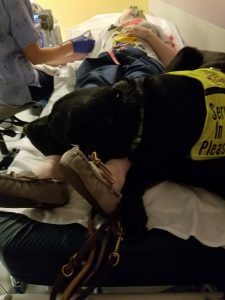 Be very cautious of non accredited organizations as there are many selling Service Dogs that are aggressive, untrained, and they offer no follow up support.